branches cut off, originally uploaded by shooting brooklyn. Yep. It's spring cleaning time. I've been hearing a lot of chainsawing going on, but I haven't seen the City in action yet. This tree's cuts look awfully healthy, but I'm sure it was with excellent reason that the branches were trimmed. 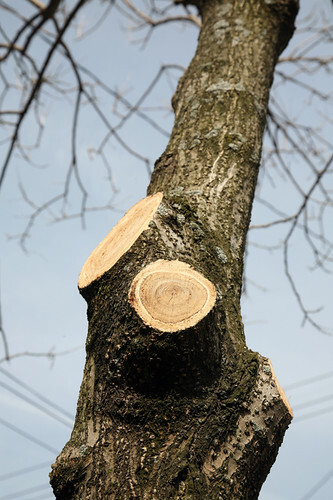 Don't forget, if you're doing your own pruning (you garden-havers, you), bundle it correctly to allow for the chipping and burning of the wood. We wouldn't want the Asian Long-Horned Beetle to have its way with our hardwoods. Thanks to Shooting Brooklyn for adding this photo to the Best View in Brooklyn photo pool! A tree pruning company was hired to prune many blocks in the neighborhood back in early winter this year. The City prunes 10 % of the trees in a neighborhood each year so by the 10th year all the trees in the neighborhood would have had their pruning. With our currently mayor the 10 year period was shorten to 7. Finally, I'm not sure if everyone is awared that there's a fine up to $15,000 for damaging or killing street trees without permit. Please report these illegal activities by calling 311. Thank you for the great information! A well-pruned tree is much better than a fallen branch on a person. And thanks for the reminder about fines. A tree on my block was vandalized last year; I'd love to have caught the person who did it. tree pruning company Phoenix Az, so keep on posting regarding on this matter.